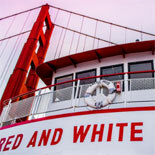 The Golden Gate Bay Cruise has been a highlight on any visit to San Francisco for 70 years. Cruise along San Francisco's breath-taking waterfront, under the majestic Golden Gate & closely around notorious Alcatraz Island. 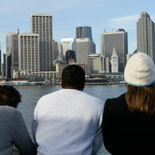 This is San Francisco's ONLY bay cruise with foreign language audios available in 16 language choices. Fantastic Photo opportunities and much more! Departing from Pier 43 1/2 in the heart of Historic Fisherman's Wharf, sail past the San Francisco skyline and view the lively neighborhood of North Beach, the famous swimming clubs of Aquatic Park, the historic vessels at Hyde Street Pier, the San Francisco Maritime National Park, and numerous other exciting sights. As you head west towards the Golden Gate Bridge, cruise along Fort Mason and the Marina District which was devastated in the 1989 earthquake. Next, enjoy views of Crissy Field and the lush hillsides of the Presidio, both former army installations that are now part of the Golden Gate National Recreation Area. Don't miss incredible photo opportunities when sailing directly under the massive 4,200-foot span of the 746-foot tall Golden Gate Bridge. As you steam back into the Bay, travel past the wildlife reserves of the Marin Headlands and the legendary town of Sausalito, once home to the 1960's flower generation. 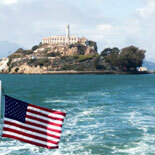 With Angel Island State Park to your left, slowly cruise around the infamous Island of Alcatraz. On your way back to Fisherman's Wharf, see the San Francisco-Oakland Bay Bridge, and Coit Tower. A full bar with drinks, snacks and merchandise is available aboard. After a full hour of exciting sights, the barking sea lions at Pier 39 welcome you back to Pier 43 1/2, where you can visit two National Historic Landmarks, the WWII submarine "USS Pampanito" and merchant vessel "USS Jeremiah O'Brien". 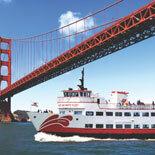 Get your eTickets today, take the Golden Gate Bay Cruise and experience the best of San Francisco Bay! The Golden Gate Bay Cruise is available in 16 language choices, that includes: English, Spanish, Korean, Arabic, Hebrew, Chinese, Japanese, Vietnamese, German, Russian, Indonesian, Taiwanese, Hindi, Portuguese, French and Italian. 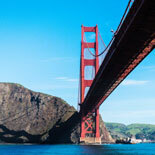 Take the Golden Gate Bay Cruise and experience the best of San Francisco Bay! 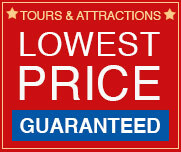 Cruise offered daily starting at 10:00 am. Times vary by season. Closed on Christmas Day. Departure Dates and Times vary with season. Summer-May 24- Sep 2: 9:15 am; 10:00 am; 11:15 am; 11:45 pm; 1:10 pm; 1:40 pm; 2:30 pm; 3:00 pm; 3:45 pm; 4:15 pm; 5:00 pm & 6:15 pm. Cruise departs from Pier 43, located on Fisherman's Wharf at the foot of Taylor Street. Child Ticket: 5-17 years old. Children under 5 are free. 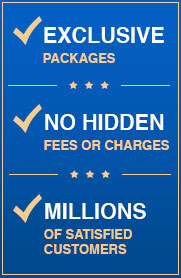 Reservations are not required, but you should check availability before desired cruise date. The Customer Service number will be on your eTicket. San Francisco has many microclimates with frequent weather changes. It is recommended that you dress in layers or bring a jacket.